It almost seems like a new phase in my life. Finally I have bid good bye to Charlottesville my home for the past two years…and have arrived in Maryland ( to Seejo’s place) with half my luggage and a lot of trepidation. My new job starts next Tuesday (10 of September)..aptly on Ganesh Chaturthi. I had 2 weeks of relaxation time before I started my life as a career woman. Here is the description of a long postponed trip to Chicago. I had been meaning to go there for the past two years …only put off by the fact that Chicago is insufferably cold for half the year. Anyway this trip was planned to be something like a get together for my D.J Sanghvi friends. Initially everyone seemed enthusiastic…only to peter off in the end. What started like an deluge ended like a trickle but the trickle was pleasant enough! In the end it turned out it was only Aparna, Pulkit and me. 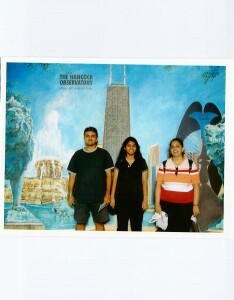 I loved Chicago. It had all the charm of the big city which I missed sorely coming from a little village called Charlottesville. Big buildings, traffic, lots of cars on the road, huge shopping arcades, seedy neighborhoods, lots of restaurants, public transport, local trains…..the whole lot! In fact as Aparna was taking me about I felt more and more like the poor country cousin come a-visiting to the big bad city. Aparna was very amused at my reaction most when I exclaimed “Wow so many taxis together” when I saw 4 cabs at a traffic signal together!! The first evening was spent in seeing around the university campus….eating at a Mediterranean restaurant and gossiping. Aparna took special care to pint out all the seedy looking joints and all the places where her friends were mugged, about to be mugged and escaped mugging….Seemed to me at the end of that spiel that the UIC students probably didn’t get much time to “mug” but just ran around trying to escape potential muggers (hehehe silly pun!!)!! If Chicago turned out to be a moving experience it was undoubtedly due to that night…for Aparna moved her house that evening and me fresh from the experiences of moving my house assisted her. We spent a good part of the night lugging suitcases and bags and trash bags filled with stuff upstairs to her new house. Pulkit reached the next day and then we went on a cruise to the downtown. The highlight of the Chicago trip was definitely the cruise in the Lake Michigan with the tour guide pointing out many of the city’s architectural wonders. Ofcourse the Sears towers was the prominent amongst them all ..with the guide repeatedly assuring us that it was the tallest building but one in the world ( the one is the some tower in Kualalampur, Malaysia) Most of Chicago city was devastated in a fire in 1871 and therefore several buildings in downtown were rebuilt. Almost all buildings are built along the sides of the Lake Michigan such that all of them give an excellent view of the lake. Michigan avenue also boasted of a incredible street which has huge shops on either side ( with suitable prices of course) . We decided to go up the John Hancock towers (after sampling cheesecakes from the cheese cake factory at the base) The view was indeed fantastic….We could actually see 4 different states from the top ( atleast we could make out the lights that corresponded to the small description given on top!!) a good view of the Lake Michigan with tall buildings surrounding it…almost like out Marine Drive in Bombay…..Ended the day with dinner at a Greek restaurant in Greek town! Another enjoyable trip was to Devon, the mini India in Chicago. Gorged ourselves on Indian chaats and snacks, windowshopped at boutiques offering the “latest in Salwar kameez designs”, chatted with an voluble Indian cabbie on the way home who was delighted to find a Desai amongst hus. He was a Patel , he hastened to inform us and asked us about how Bombay is, how Pune is, whether Bal Thackeray is the same and whether there are jobs for people over 30. Pulkit enjoyed a heart to heart with him while we sat there snickering , giggling and trying to stifle our laughter. The unknown errors of our lives: by Chitra Banerjee Divakaruni. Short stories set in America featuring Bengalis. The Ice Candy Man: Bapsi Siddhwa .Finally got around to reading that book. And educative website for the week…..here is some dope on the history of Chicago!! Starring Mithunda and Smita Patil describing the Naxalbari movement of 1966. The movie ended on a funny note though….didn’t justify the movement nor did it criticize it. Or may be I just missed the point the director wanted to make. Continuing the bangla theme….Satyajit Ray directs a story by Tagore…Starring the Ray favorite Soumitra Chatterjee….